Yes, you can get a loan with bad credit—but it’s harder to get a good deal. You have fewer options available, and loans are typically more expensive. But it’s rarely impossible to borrow, even with a “less than perfect” credit history. Low credit scores make it easy to fall into expensive traps, but a bit of preparation can help you avoid the worst problems. After a period of borrowing wisely and repaying on time, you can rebuild your credit so that it’s easier to borrow next time. Bad credit is a credit history that contains multiple problems, including late payments, bankruptcy records, and collection accounts. It’s hard to assign a particular credit score to the “bad” category because different lenders analyze your credit in different ways, and they’re willing to lend to different borrowers. Still, it’s safe to say that negative items in your credit history can result in bad credit. A lack of credit (or thin credit with one or two problems) can also lead to low credit scores. Your credit may not be as bad as you think. If anybody says that your credit is ruining your chances of getting a loan, verify for yourself. Check your credit (it’s free for U.S. consumers to do so annually). It’s possible that legitimate problems exist, but there might be a few errors on your credit report. By fixing those errors, your credit may improve substantially. Shop around for loans, and include credit unions in your search. Those institutions may be willing to work with you even if you have bad credit. Credit unions are often smaller than large banks, and they have a community focus. Because of that, they may review your application personally and discuss it with you—as opposed to just looking at a credit score and other numbers on the loan application. If you sit across the desk from a human being, you can better understand what they need, and they can understand where you've been and what you need. Small, local banks are also a good option. Like credit unions, they may have a community focus and reasonable rates. In addition to local brick-and-mortar options, find out what online lenders have to offer. Peer-to-peer lending services are one option for getting a loan with bad credit. Instead of borrowing from banks (with rigid rules and high overhead costs), you can borrow from individuals who fund your loan. They may be more willing than local banks to take risk, but they’re not looking to lose their money. Marketplace lenders source funds from P2P lenders and other sources. Online loans have continued to evolve. These non-bank lenders have different appetites for risk and use creative ways to evaluate your creditworthiness. As a result, they may be willing to approve you with lower credit scores. Just be sure to avoid payday loans, which are costly short-term loans (and they're heavily promoted online). Most peer-to-peer lending sites allow you to borrow from strangers. However, if your credit is really bad, your friends and family may be your only option. They know you, and they may be willing to fund your needs. But if you borrow from friends and family, do it properly so everybody’s protected: Document the loan terms on paper, and consider using a third party to process payments. For more details, see Is a Family Loan a Good Idea? Co-signers: If friends and family can’t or won’t provide funding, they might still be able to help. 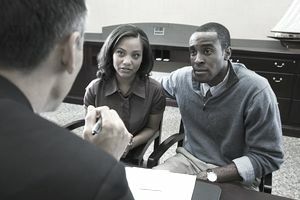 If they have good credit, they can help you qualify for a loan as co-signers. But doing so is risky for them, and you may be putting them in a difficult position. For more details, see How Co-Signing Works. If you’re having trouble getting approved, you may need to put up collateral. By pledging something of value, your lender knows you’re serious. Plus, lenders have a better chance of collecting on the loan because they can take your collateral and sell it. Be careful when pledging collateral. If you have equity in your home, you can probably borrow against it, but the risks are significant. If you can't make all of your payments, you might be forced out of your home in foreclosure, making a bad situation even worse. Some lenders (and con artists) take advantage of you when you're down. They specifically target people who are desperate to borrow, knowing that you have few options available. These lenders charge astronomical fees and make it nearly impossible to dig yourself out of debt. If you borrow at high rates using payday loans, car title loans, or any lender who will "approve everybody," you risk making things worse (not to mention repossession, if you use your car as collateral). Sometimes, you won't even deal with a real lender: Scam artists advertise loans, but you need to pay steep application fees up front. Ultimately, you don't get approved, and you don't get your money back (this is known as an advance fee scam). Avoid paying upfront fees to get a personal loan—any processing fees should come out of your loan proceeds. Applying for loans, especially if done the wrong way, can further damage your credit. As you shop around, submit all of your applications within a short period of time. This shows lenders (and credit scoring models) that you’re just shopping around—not trying to get a new loan every month. For most loans, try to submit applications within 30 days at most. Credit scoring models are designed to account for the fact that it takes time to apply for loans, and that wise consumers shop around. Those models should consider multiple applications within a short timeframe to be a single application. If you wait a month or two to apply with various lenders, several problems arise. For starters, offers may no longer be valid, and interest rates may change. What’s more, you’ll rack up “inquiries” in your credit reports, which may make it look like you’re struggling financially.